Edie combines downtown ease with utility. Crafted in shimmery polished pebble leather, the soft, slouchy silhouette of the 31 is slightly smaller than the original. It conceals a three-compartment interior designed for perfect organization. Was a little nervous buying online as I prefer the more tactile shopping experience but was not disappointed. Beautifully boxed for delivery with ribbon and protective bag. Colour as expected and perfect size, not too big but able to carry everything I need including Ipad. Like the security of the zipped middle section and ease of access to phone, keys etc on the side sections. 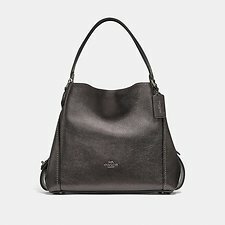 It's my second Coach Handbag and love them both.